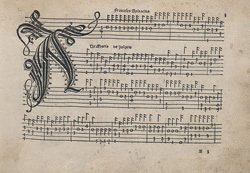 Catalogue : RISM 15075; Brown 1507 1-2 ; Arthur Ness, «Sources of lute music : italy», New Grove (1980), 24, p. 41. Contents : 38 Lute pieces (5 duets), intabulations of motets, chansons, a Flemish song and instrumental ensemble works by: Josquin (5), Ghiselin (2), Hayne (2), Alexander Aglricola (1), Brumel (1), Caron (1), Ockeghem (1), Urrede (1), Weerbecke (1), Vincenet (1) arrangements of vocal works previously published by Petrucci 1501-1505; 17 Ricercars by F. Spinacino. Each volume contains Instructions for reading the Tablature in Latin and Italian.